This entry was posted on Tuesday, December 4th, 2007 at 3:41 am	and is filed under Uncategorized. You can follow any responses to this entry through the RSS 2.0 feed. You can leave a response, or trackback from your own site. I love this Idea. I so want to do this with my own… I don’t have many books yet though… i’d love to have a list of suggested books. Hey, wait a minute…did you repost this because of me? This year I am incorporating the family gift box. Instead of Santa leaving all the presents to individuals, there will be a box of family presents (DVDs, games and such). I am covering a sturdy box in holiday fabric and I am hoping it will last for years. Last night my daughter and I read The All-I’ll-Ever-Want Christmas Doll by Patricia Mckissack. It is on par with Jonathan Toomey (also one of our favorites). Beautifully complex illistrations (I love pretty kids books) and a great message. First, I found the Christmas Miracle of Jonathan Toomey last summer super cheap at RDonline, in a beautiful gift box with an ornement and a CD. I knew to grab it because you mentioned it last year. Second, I wanted to tell you that this weekend, when I got some time to wrap, I used it to wrap up our 25 Christmas books! The first one was a special advent book I picked up. Anyway, that’s something I never would have done before, 100% inspired by you, so thanks. I think I’m officially a Chris Groupie now. We also do the Advent wreath at dinner, and another one I like is taking a ride to see Christmas lights either on Christmas eve or the night before, the kids in PJs, Christmas music playing, and everyone sipping hot chocolate. My daughter is only just 2, so we don’t exactly have any traditions yet. I know I don’t want her to be all “Santa! Toys! Gimme!” about Christmas and I want to teach her the religious meaning behind Christmas. My sister has a 25 piece Nativity that she wrapped individually and her daughter (4) opens one every night and my sister tells her the first Christmas story again and again. Each night she plans on emphasizing the role of whatever pc they opened that night. This is something she just started this year so it might get old for her daughter but she is hoping that by Christmas her daughter will be able to tell her the story. It’s going OK so far, even though they only have a manger and a couple of animals. We’re on board with Christmas/winter books and with advent candles, but we do Jesse Tree stuff for family reflections. The Jesse Tree follows the story of Jesus from the creation story to the birth, so we do the small Bible reading and reflection found here (http://www.rca.org/NETCOMMUNITY/Page.aspx?pid=1628&srcid=1625) and the kids create a tree ornament that symbolizes that day’s story. I just wanted to say that I read this original posting a few weeks ago, and we’ve decided to go for it with out kids. We have almost 4 kids (I am due in January) and I love to bring a little bit of holiday spirit into everything I can, from Halloween until February. This is such a wonderful way to do this! My kids LOVE reading and the alone time we get to spend together. I can’t thank you enough for this post. You’ve changed our holidays forever!! I did the same thing with book when my children were younger. It was a great advent idea. We just love books! Now, they get a Playmobil advent calendar and we read 2-3 books during the month. Our favorite is “The Best Christmas Pageant Ever” by Barbara Robinson. A few of our traditions include making our own beeswax candles for the holiday season, making and decorating our advent wreath, opening our advent calendar sacks which I fill for each child, etc. 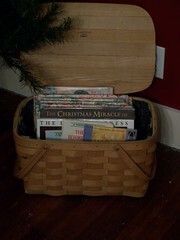 This year, we also collected all of our Christmas books up in a basket to read during the season. The kids love this. My toddler sits next to the basket and goes through them one by one. Our favourite is “Weihnachten in Bullerbü” (Christmas in Bullerbü) by Astrid Lindgrin. I don’t know if you can find this in English but, if you can (or can read it in German, LOL) it’s a wonderful book with wonderful illustrations. One of our favourites. I stole your book wrapping idea. I was so proud of myself, because last year I used up all the old wrapping paper to wrap the books for this year. Woohoo! We’re doing the book thing this year and the kids love it. I also hand-made little envelopes last year and the kids get to open one every day leading to Christmas. Inside, I put an activity we can do for the day—either decorate a gingerbread house, watch a holiday movie or put candy canes on the Christmas tree. I know I ‘borrowed’ this idea from someone but not sure who. We also get in the car a couple of nights before Christmas and drive around looking for the best holiday lights in our town. Dangit. I missed doing this one. But will definitely plan ahead for next year. We have angel food cake with candles on Christmas Eve and we sing Happy Birthday to Jesus. Thank you for the wonderful idea. We already have a great collection of Christmas children’s books (probably about 20), but I have never thought about wrapping them! Every year we do a scavenger hunt on Christmas Eve with our four boys, ages 15 to 2. My husband writes these clues that are so corny (terrible). Half the giggles come from us making fun of his complete inability to rhyme using real words which leads to his desperate attempts to make up words to force a rhyme. (For example, “Who knows, maybe you should look in the tub. It might be in there bub.”) Dr. Suess he ain’t. Anyway, these clues send the boys all over the house and doing different tasks. This year they had to build a miniature snowman and bring it in for hot cocoa. We always stop and play a game (our new annual favorite is Whoo-Nu). Sometimes they have to clean the house or set the table along the way depending on how much we got done in preparation for family the next day. We read or tell the Christmas story. This year, each person said one sentence. We sing songs. We also open a special gift box with different items that represent the gifts we have in Christ. We try to guess the gift. For example a toy telephone represents prayer, and then you look up the scripture to see if you’re right. Depending on when we start the hunt (which depends on what all is going on with family Christmas Eve) we may watch a movie together. (The hunt can take hours or minutes depending on the clues.) 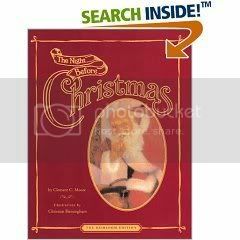 A favorite has been “A Muppet Christmas Carol” but we couldn’t find it this year. 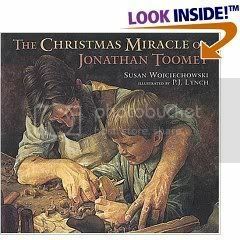 So this year we watched “The Christmas Miracle of Jonathon Toomey” on DVD. 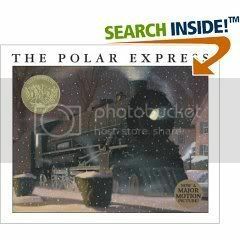 This has been a favorite Christmas story book for several years so it was great fun to watch it. At the end of the hunt, their gift is always pajamas. Then the boys open their gifts to each other, their favorite part.